Are you ready to design a personal calendar using your favorite photos? Photoshop Elements 11 helps you design an attractive calendar of the kids, the girls’ soccer team, the Bullhead Moose fraternity, or any other type of activity or event you want to work with. Elements makes it easy to create professional-looking calendars. Select photos in the Organizer. Alternately you can open images in the Photo Editor and select the open photos in the Photo Bin. For calendars, you might want to select 13 photos — 1 photo for the calendar cover and 1 photo for each month. 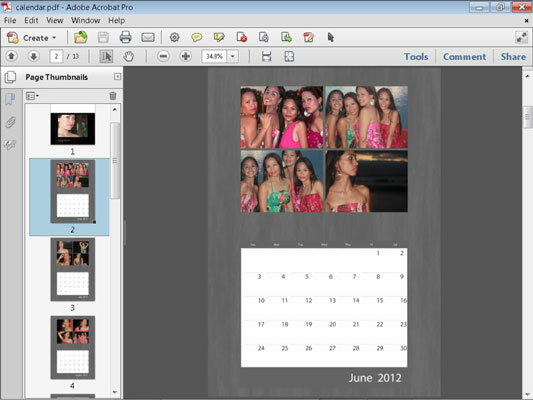 You can also choose 12 photos and use one of the calendar months for the cover photo. Open the Create panel and click the Photo Calendar option. Choose an output source the same as when choosing a source for photo books. When saving creations you have a choice to save as a Photoshop Elements Project (*.PSE) or as an Adobe PDF (*.PDF) file. Here, a calendar is saved as a PDF document and opened it in Adobe Acrobat.